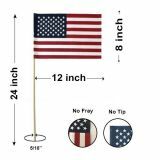 Get the best of both the worlds of the convenience of a mini flag and a larger display item all at once with these upgrades size US mini flags from Tuff Flags. 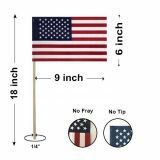 If you want a larger flag than the customary 4"x6" size in hand held Mini flags, choose these upgraded size flags that are available in sizes 6"x9" and 8"x12" These hand held Miniature U.S. Flag is an upgrade from the small 4"x6" flag and are well suited for patriotic and national events. 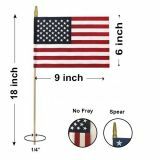 The No Fray material maintains an adequate life for this inexpensive Mini American Flag. Shop from our collection of Upgraded Size US Mini Flags and get the advantage of the best prices, quick shipping and much more! 100% customer satisfaction guaranteed! Choose Upgraded Size US Mini Flags from the well-stocked store of Tuff Flags and show your patriotic pride. Just let us know your needs and we can help you find the perfect match. Call us at our toll free number 888-287-3524or email us at customercare@tuffflags.com and we can help you choose the best.